There’s a bit of a story behind what I consider to be, hands down, the best burger in Contra Costa County. So my first job was a busboy position at Moraga Country Club, a place I spent much of my childhood playing tennis, and hanging out by the pool. I worked there from September 2004-December 2005. Without a doubt, the best part of every shift was looking forward to a delicious cheeseburger at the end of every shift. Last year, MCC tore down the clubhouse, and built a big, new, fancier one. MCC is by far the most casual, and least snooty of the Contra Costa Country Clubs, even with the recent revamping. But while everything else was updated, would the burger stay the same? Or would another part of my childhood be lost in oblivion? In short, it has changed, but it still retains much of what makes it so good. The MCC burger and fries rings in at 11 bucks. But you’re getting what you pay for in the relaxed environment. Obviously I have a soft spot for my former place of employment, but who doesn’t want to relax with a beer and a burger with some brand new plasmas in a bright brand new lounge? Anyway the burger itself is a 1/2 pound extremely juicy patty, with your choice of cheese (cheddar, swiss, bleu, or brie), alongside pickled red onions, butter lettuce, served on some sort of egg bun . My inner fatty has embraced this new choice of brie, and so that’s the choice I’ll be writing about. I thought I’d be sad that the burger no longer comes with bacon, but the patty is so juicy and flavorful to begin with, that coupled with the richness of the brie, you realize that you’re not much missing the bacon. Sometime I’ll try adding bacon, to see if it is in fact overkill. The pickled onions serve to cut down on the richness a bit, and add a unique flavor to each bite. I also really enjoy butter lettuce because I think it actually has a bit of a taste that stands up to meat. 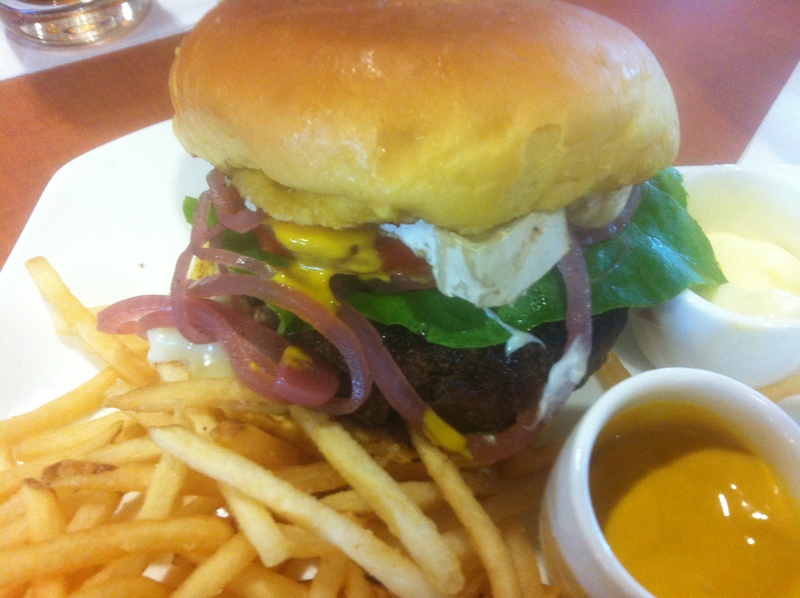 The flavor combination of this burger gives it a refined quality. That said, if I was describing the experience in one word, I’d have to use: rich. MCC brought back the shoestring fries, as opposed to the delicious ones I used to fondly sneak during busy dinner services. These ones are average, in my opinion, but they give you plenty of them, so you can always grab about seven at a time and not make a major dent in your fry stash. The MCC burger is probably my second most eaten burger (after Nations), and I’m relieved that it has survived the reopening. As a side note, the MCC Restaurant is open to members only. Fortunately, members can bring guests, so if you’re in major need to try the best burger in the county, you know who to call on! i grew up 5 minutes from the MCC (and even worked in the pro shop for a summer! ), and have never once tried the restaurant. i will definitely make a point to try this burger next month when i’m back! oh gosh, by my calculation it must have been around 2000/2001? I think i was a sophomore/junior at miramonte. i also played tennis there for years with bernard haha! seems like a lifetime ago! too funny, small world indeed.